At R J Mullin Ltd, we have a team of specialist stainless steel, mild steel and aluminium fabricators who can manufacture virtually anything that can be made from metal. R J Mullin Ltd specialises in making custom built stainless steel bench tops for private homes, restaurants, hospitals, surgeries and laboratories. All of our bench tops are built to custom specifications. We also make hand rails to suit every possible requirement, including for stairs, boats, balconies, etc. 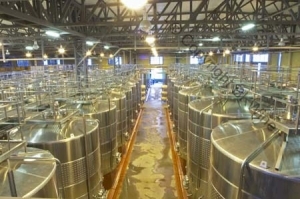 The wine industry, olive oil production, and paint manufacture are some of the uses our stainless steel tanks and vats have been put to. R J Mullin Ltd have made aluminium bus panels, display stands, football goal posts, shower trays and a huge variety of different items. We can provide a fixed price for fabricating well defined items. Call us now to discuss your metal requirements – if you can draw it – we can make it!